Hopkinton Massachusetts is a small but wonderful town located West of Boston. Famous for being the start of the Boston Marathon. Since it's a small town, finding a siding contractor in Hopkinton can be difficult. That's why this homeowner reached out to us. 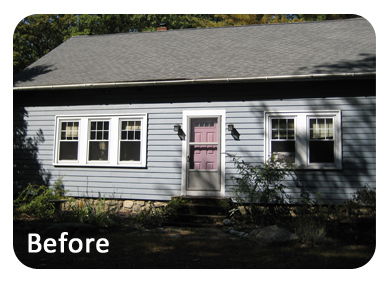 We removed the existing siding on this Hopkinton home and installed new blown-in insulation. We installed new house wrap to protect the home from moisture. Then we installed new Everlast Composite Siding in the Chestnut color. We also installed new trim around the windows and doors, new fascia, rake boards and soffits. We're thrilled these homeowners chose us as their Hopkinton siding contractor. One of our employees had a personal relationship with this homeowner who happens to be an interior designer. She..